The Panasonic KX-TA824 Advanced Hybrid System is expressly designed to streamline office communications by organizing your phone lines into a cohesive system and making a host of advanced features available to each extension. The KX-TA824 offers a variety of options to enable customized solutions. You can assign specific lines to each phone, make office-to-office intercom calls at the touch of a button, forward your calls to an outside location, or your cell phone, page all system extensions and much more. So you can tailor your telephone system to the varied needs of your office. This powerful combination of flexibility, high performance and value has made Panasonic Communication Systems top in in Key Telephone/ Hybrid Systems. The KX-TA824 system works with standard telephone lines, so you don't need to upgrade your phone service. It features a base configuration of three central office lines and eight stations. It can be easily expanded to up to 8 CO lines and 24 stations with the addition of two plug-in cards (models KX-TA82470, KX-TA82483 and KX-TA82481). By adding an optional Panasonic KX-TVA50 Voice Processing System, you can enjoy automated attendant services, individual voice mailboxes and more - without expensive software or hardware upgrades. And when the KX-TA824 Advance Hybrid Telephone System is integrated with the KX-TVA50 Voice Processing System, you can benefit from the advance features listed below. with all of these choices, it's easy to custom-design a system that's just right for your home. 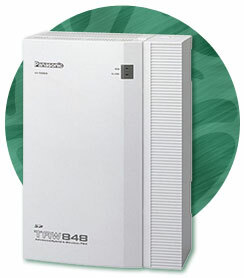 The KX-TAW848, designed specifically for upscale residential homes, SOHO applications and small business environments, offers a modular design that allows you to tailor the system to meet your specific needs. Similar to the popular KX-TA624 system, the KX-TAW848 allows connectivity with the KX-T7700 series of proprietary wired telephones, single-line devices and voice mail integration. However tha KX-TW848 is unique to its KX-TA624 sibling in that it is not only a traditionally wired PBX system, but it also has the option of adding a complete Multi-Cell Wireless phone system. This dynamic addition provides a new level of clear wireless system communications with expanded area coverage unheard of in a system of this size and price. In terms of capacity, this system can be configured with a maximum of 8 CO lines and up to 24 wired and 28 wireless extensions. Wired extensions include the 7700, 7300 and 7000 series proprietary telephones, single line telephones (SLT) and up to 4 door intercom/ openers. A modular designed combined with PC programming makes installation fast and easy. And any additional maintenance can easily be performed off premises by the installer with the optional remote card. All in all, the KX-TAW848 is a great system if you are looking for the latest technology combined with extraordinary flexibility at a price that won't break the bank.